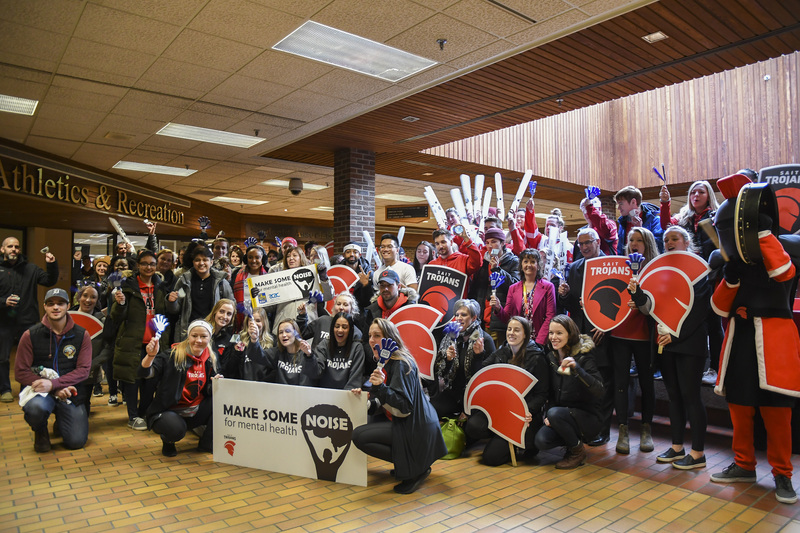 Students, staff, community partners, friends and supporters joined SAIT Trojans student-athletes on Jan. 11 for the fifth annual Make Some Noise for Mental Health mobile pep rally. The pep rally began in the Campus Centre and then toured around campus for an hour, involving about 100 students and staff along its route. During the event, a drum circle was held in the Stan Grad building. 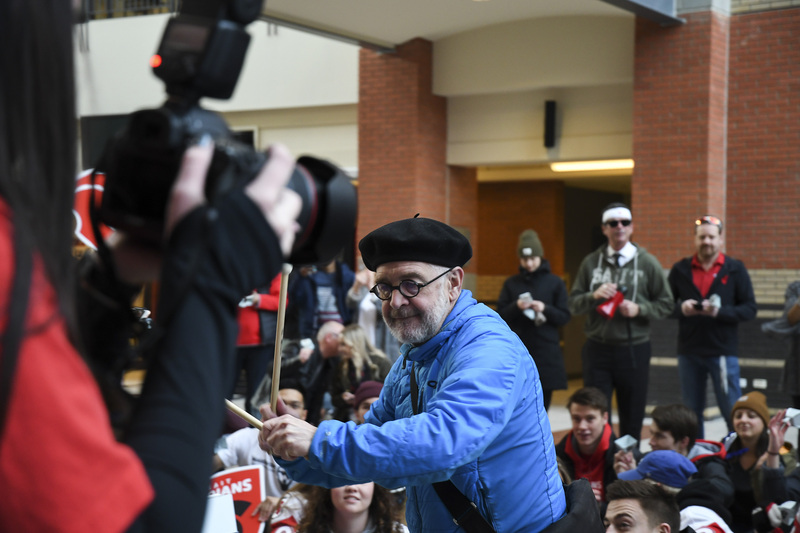 “The purpose of the drum program is to bring some mental, emotional, spiritual well-being, wellness to campus,” said Tim Nethercott, chaplain with the SAIT Interfraith Centre. “Drumming is a widely used modality in mental health. It reduces heart rate, blood pressure and elevates the mood,” said Nethercott, who is a United Church minister. Make Some Noise for Mental Health was created by Billie Busby, Marketing and Communications Co-ordinator for the SAIT Trojans. The idea for the event came to be after the Brentwood murders in the spring of 2014. “We felt really empathetic for the families that were going through the tragedy,” said Busby. Busby and her team decided to work with student-athletes to focus more on mental health alongside their physical health. “Consulting with the student athletes, they all decided that awareness and promoting the resources on campus was important to them,” said Busby. In January, 2015, Make Some Noise for Mental Health was launched at SAIT. The first year was focused on athletics and recreation and over the years has grown across campus, as well as other schools. “I think it’s really important that we raise awareness for such a cause and I think it’s great that the SAIT Trojans as a whole do it together,” Irina Korovina, a SAIT student-athlete. “We started with the student-athletes because we feel that often they are looked at as role models,” said Busby. “They’re often the last to ask for help. When things maybe go awry or they have issues come up in their lives they don’t want to ask for help. “They feel there is an expectation on them and we wanted them to know that stigma doesn’t need to be there,” she said. Make Some Noise for Mental Health is held once a year in January. “We wanted to focus on a particular time that we knew that SAIT students especially had extra challenges,” Busby explained. “Sometimes when you start off in a regular semester season, you might find out where student development and counselling is but you might not need it then. “Make Some Noise is an awareness campaign to try to open up conversations and reduce stigma on campus while promoting the resources that are available to students and staff,” said Busby. Make Some Noise is promoted throughout campus through various activities as well as at Trojans games. On Jan. 21, Make Some Noise and student development and counselling collaborated on a stress less event. “We wanted to do something over lunch that people can pop in and fit within their schedule,” Busby said. On Jan. 30, a DJ Spin event, with spin bikes for people to ride, was held to promote wellness. That day was also Bell Let’s Talk day. “I’ll be honest, I’ve been here 11 years and worked here six years and even I didn’t know all the resources until we started really looking into this campaign and what could we do,” Busby said. As a news reporting and communications major in the journalism program at SAIT, Amanda Lee is working as a writer for The Press during the 2018-19 academic year.